How could 141 years pass without George Eliot’s “Middlemarch” being turned into an opera – what richer, more meaningful, always timely source is there? 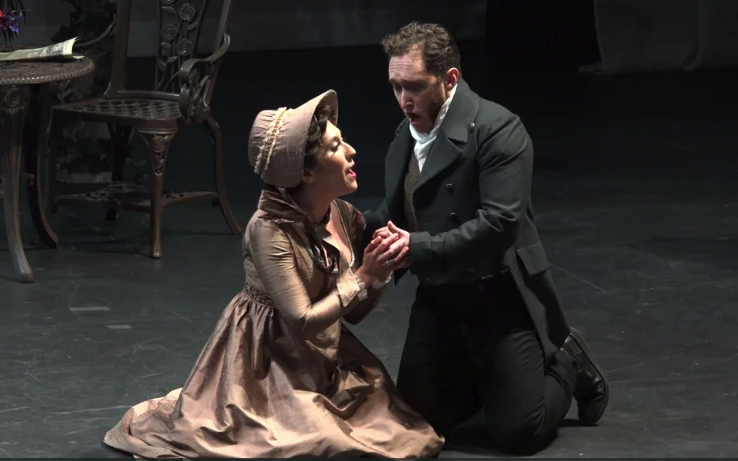 The long wait is over with tonight’s premiere of “Middlemarch in Spring” in San Francisco’s Z Space, a delightful event marking the appearance of a rare phenomenon: a new opera of dramatic integrity, with music that’s both boldly contemporary and instantly accessible. Charlottesville Opera gave Middlemarch in Spring its East Coast premiere March 23 and 24, 2017 at Charlottesville’s historic Paramount Theater coinciding with the Virginia Festival of the Book. See video clips from this fine production here . And the University of Tennessee Opera Theatre mounted a new production April 13-15, 2018 at the Bijou Theatre in Knoxville. A major new review appears in the UK in George Eliot Review, hailing Middlemarch in Spring as “a fine adaptation of Middlemarch which is also a work of originality and charm. Musically and dramatically this is a moving and enjoyable work which gives a concentrated expression of more of George Eliot’s novel than one might think possible in a brief, two-act opera.” – Delia Da Sousa Correa (Open University, UK), Michael Halliwell, University of Sydney. Read the full review here. “A happy offshoot of Middlemarch.” He writes, “…this two-act chamber work is such a light-hearted and buoyant creation that it’s hard not to walk away feeling that all’s right with the world…. Shearer’s score – tuneful, elegant and canny in its creation of musical character – furthers that notion. Working with striking concision, the composer helps us hear the inner nature of each of the characters, from Casaubon’s granitic self-regard to Celia’s charmingly bubbled-headed cheeriness.” Read the full review here.
" . . addictive quirky textures and bold statements"